The Black Crows Nest was taken care of, but the next place that is on the list of targets is The Black Crows Fort. General's Blade: Attacks made by a Black Crow General count as C tier abilities which moves at 15 m/s. Garret had asked the man before him a question in regards to his involvement in the camp. Not that it was, when all was said and done, any of his business. But one could never be too careful, especially considering their location. Garret's gaze went to the corpse that had been dispatched before he had gotten there. It had been violently cut up, and he wondered how much of that force was necessary before bringing his gaze back up to the man who stood before him. He briefly recalled the smoke bomb that had been thrown in their prior fight. The man's style was likely similar to that of a Kou operative's fighting style, and Garret wondered if, perhaps, the man was from the homeland to become a new operative for their operations. He hadn't heard anything from the mainland in regards to that, though. The first italicized paragraph is not counting towards word count. Feel free to post before Diego. I will either post again after you, or wait for Diego to post. We'll see how it rolls out. A bitter chill passed over the northern lands of Reim as Diego and his pets ambled into Portsmouth. He wrapped the green wool cloak tighter around himself, still adjusting to the colder climate compared to Heliohapt. The trio of Fanalis and beast wandered through port town, surveying the buildings that were in various stages of construction. It looked like a swath of forest had been tore down and re-purposed into materials for building the town. Diego wondered how many animals had been displaced in the process and would continue to be displaced as the town grew. His homeland had been heavily forested and many types of wildlife could be found sheltering under its canopy. His tribe had lived in unison with nature, rather than refitting nature to serve their purposes. A tremor of anger filled him, glittering in his orange irises, at the town's disregard for the animals who had lived in the area. Yakuroro's conversation with Diego floated to the surface of his memory, allowing the the emotions to pass. The Imuchakk magician had told him that there were many different cultures and people in the world, while some were bad, most were living the best they could with the situations they were dealt. Diego had found himself in the northern stretches of Reim, searching for signs of Jagang. While the Fanalis boy had promised Yakuroro that they would deal with the dangerous magician together, Diego couldn't help but look for him. The idea of searching small towns and villages for clues seemed like the best option. He had passed through many such places on the way to Portsmouth, but Diego had yet to find a trace of Jagang. A tavern loomed in the distance, built to service travelers and workers alike. Hungry, tired, and cold, Diego entered hobbled inside eager to get out of the wind. Trixie and Zanzibar slipped in behind him, relieved to see a roaring fire in the hearth. The beasts found a warm corner out of the way to lie down where they could still keep an eye on Diego. With food ordered, the Fanalis boy found an unoccupied table to sit at over a pint of spiced rum. Alcohol was something Diego avoided, but the serving lass had assured him it would warm his bones. Ignoring the looks he got as he sipped the rum, Diego listened to the conversations that drifted to his ears. The harsh liquid burned as it went down his throat and the Fanalis grimaced, but found it did its job of making him feel warmer. He overheard mention of a bandit problem outside of the town, but what caught his attention was the group's name, The Black Crows. His body tensed at their mention, Diego certainly remembered them. The Black Crows had taken Trixie during his first journey to Reim, a very traumatic experience at the time. Fate had certainly looked out for him when he looked back. Both Trixie and himself had learned much from that time, heck now he could shoot a bow. Still, the idea of the Black Crows causing trouble for the people who lived in Portsmouth bothered him. By the time he had finished his rum, food had arrived and he tore into it like a ravenous beast. A plate of choice meats was sent Trixie's way, who also greedily gobbled it down, barely saving any for the furry, white spider. Dried meats and fruits were nothing in comparison to a fully cooked meal. Once they were finished, Diego led his band of beasts in the general direction of the Black Crow's camp. Which is where they now found themselves, staring at a litter of bodies. Diego looked from the horrible sight to the two men who were talking nearby. He was hidden behind a wall, peeking out in an attempt to gauge if the men were friendly or if they were a threat. Normally, Diego felt secure in his abilities, but with the carnage at their feet, he was unsure if even Trixie would stand a chance. He was torn between relief that the bandits were dead and the fact that they had been killed. Yet, Ayero and Trixie had both taught Diego that killing was necessary. Diego took a deep breath and exhaled, resolving himself to approach the men. He kept his bow strapped on his back and gestured for Trixie to follow behind him. Diego did not want to approach in a threatening manner, hoping that they wouldn't attack first and ask questions later. The men's Kouen features became apparent the closer he got and he began to doubt his decision. Most places he went, Diego heard the worst of Reim's new overlord. Still, Yakuroro's words echoed in his head, coupled with his experiences of racism for being a Fanalis. Diego came to a stop about ten meters away from the two men, stepping away from the corpses. "Wow! Did you two do a number on these bandits or what?" Before Jian had a moment to introduce himself, a new individual made their appearance. The sudden movement from the corner of his eye caused Garret to spin forty five degrees to face Diego's approach, immediately enterring a martial-arts stance as he did so. The moment passed, and Garret dropped his guard if just ever so slightly as he noticed that the one who approached them was but a young child, likely under the age of 15. Perhaps as young as ten.... What is such a young child doing here? Garret narrowed his eyes as Diego spoke out to them. Was it a trap? Was this child some sort of hanger-on for the bandits, who came out at this point in time in order to cause trouble? No. Taking a closer look, the child seemed well equipped. The bow on his back and the extremely large tiger that was trailing behind him were certainly indicators of a type of fighter he had never encountered in the past. He looked over the tiger once more, noting that she stood at about an equal heigh as he did. The air of confidence that Garret felt from the creature was similar to that of a predator, and reminded him of the time he had hunted a dangerous beast in these very woods oh so long ago. Additionally, now that he was gauging the newcomers, Garret noted an abnormally large spider. The... "Creature" slightly disgusted the Spymaster, though he simply looked at it while assessing its potential threat level. It was at this point that he considered the options before him. Part of him said that there was nothing to worry about. Yet now there were three unkown parties in total that had met in the middle of this forest. Garret was fairly confident that the man from Kou was not somebody who was working with the Bandits in any way; their fight alongside each other as temporary allies had ensured that much. With that being said, he had no true indication that the man was not simply an oportunistic individual, who would strike at him the moment he let his guard down. Likewise, the child before him was a curious thing in and of itself. What was a child, of all things, doing out here in the wilderness? Though... There is a certain sense of wildness eminating from that child. And the beast that follows him is no laughing matter either. Garret spoke first, of the two Kou men. "Who are you, and what is your business here?" The man had ignored Diego's question. As awkward as it sounded from the young child, it felt even more awkward hearing it. In Garret's line of work, there were three types of people; those who relished in the deaths of others, those who were horrified in the death of others, and those who treated, or tried to treat, the deaths of others as a dry thing, intentionally distancing themselves from the emotions associated with it for one reason or another. The first of those types were often hot-heads, and often got themselves killed, though a few rare ones survive many battles and become a force of destruction. The second of which were those that never lasted long in their work, as they couldn't stomach what they had to do. Garret was the third type; he had long since accepted death and the burden that comes with taking a life. Well, at least as much as he could. Diego's question was a powerful one that invoked a brief desire for introspection which Garret had brushed away, using his question to redirect the flow of the conversation. Diego took a step back as the Kouen man with long black hair spun around and got into an aggressive stance. Madam Trixie took a step forward to stand at Diego's side, a low growl emanating in her throat. The white and black-striped tiger scowled at the two men but settled down when Diego gestured with his hand. After seeing that Trixie settled down, Diego looked back to survey the black-haired man. He was concerned that revealing himself had been a stupid decision, but Diego could not blame the man for being on edge. After the adrenaline rush of a battle, the appearance of a mysterious person would make anyone cautious. Since the two men knew Diego was here, he would either have to calm them with words or fight his way out of here. A fight with these two was not his plan though, his purpose here was to remove the bandit threat and return the favor for the abduction of Trixie. The friendly smile not leaving his lips, the Fanalis boy replied, "The name is Diego. This here is Trixie and Zanzibar." He pointed to the tiger and spider each in turn as he spoke. "We came here to fight the Black Crows. There is some bad blood between the bandits and us. Unfortunately it looks like we arrived to late, you two took care of them." A look of disappointment washed over his expression at the last words. It would be clear that Diego had resolved to deliver justice and now the opportunity was lost. Not forgetting that the Kouen man had ignored his question, Diego dipped his head towards Garret. "I answered your questions. What about you? Who are you?" Garret looked over to Jian once more, who remained silent, before looking back to Diego. The tiger, 'Trixie', had growled and acted slightly threatening a moment before. He sized the beast up, and understood that its powerful muscles and natural weapons would be hard to deal with if he ended up having to fight it. Diego, however, put those thoughts somewhat to rest when he explained who he was and why he was there. Garret's readiness for fighting the newcomer group dropped, and he greeted the boy and his companions with a normal standing posture. "My name is Lu Feng, though my friends from Reim call me 'Garret'. The Black Crows attacked a few of my friends, recently, so I'm backtracking their forces to make sure they never do so again... There are still remnants of the Black Crows, though they are further up the mountains. Both of you are welcome to join, if you desire to do so." Garret had no real desire for either of the men to accompany him, but he did not want to bring unnecessary attention to himself. As such, his offer to allow them to follow him was more for the sake of keeping them from prying too deeply into who he was, more so than the natural desire of having company to assist him with the work he was about to do. Mentally, he sighed. This will get tough if they follow me. I will have to act discreetly in order to hide my abilities. While he was a capable Martial Artist, Garret would have preferred to have his spells available for handling large groups of opponents. As it were, however, he would not have the opportunity to do so if the group followed him. Such was life, and all he could do would be to hunker down and force his way through the situation. Besides, if they did join him on his mission, he would be able to split the duties of the fighting. Both men before him seemed capable, though from the boy it was due to the intimidating tiger that stood by his side. The spider was a small factor that Garret was overlooking. Garret would make his way towards the east, in the direction of the mountains; it was where their opponents would lay, unaware of their approach. Madam Trixie visibly relaxed once the Kouen man who identified himself as Lu Feng dropped from his battle stance. Diego listened to the man's reason for fighting the Black Crows, relating to the feeling of revenge. After the man finished, Diego beamed at Lu Feng and extended his hand to offer the man a chance for the time-honored clasping of hands. "Nice to meet you, Lu Feng! Let's do this together!" Diego shouted and leaped into the air, punching the sky with an abundance of youthful energy. Diego hummed a tune and skipped alongside Lu Feng as they headed east, Trixie following at his heel. While they walked, Zanzibar peered over at the Kouen man, blinking up with four bright eyes. "Squee~" The spider wriggled his furry, white mandibles as he warbled cheerfully. Leaping off Trixie's back, Zanzibar attempted to land on the man's back to give a friendly arachnid hug. Garret paused, shuddering slightly at the feeling of the over-sized spirder crawling on his back. Stopping in his tracks, he looked over to Diego. "Have the beast removed from my back." It wasn't simply the strange feeling of the beast that suddenly jumped upon him that caused Garret to say this, but a need for caution; should this young child give a command, the beast could attack immediately. Garret's hand gravitated to where he had hid his wand on him earlier; the boy did not yet know he was a magician, and Garret wanted to keep it that way, but he would do what he had to do in the event that he was suddenly attacked. Diego noticed Zanzibar leap and judged Lu Feng's reaction before telling the spider to get down with a whistle. He held up his hands with a bashful look on his face, "I apologize, he is a cuddler. I think it's because Zanzibar likes to be carried." With a sad, "Swiggity~", Zanzibar let go of Garret and skittered back up Trixie's leg to rest on her back. The fuzzball turned his head away from the Kouen man and pouted. Diego ran his hand down the spider's back as silence passed between the group. Growing uncomfortable with the quiet, Diego looked over at Garret. Diego wasn't sure what to make of the man's reserved nature. It reminded him of the way Liber had acted when they first met, though the Fanalis had warmed up. Still, there was something dangerous about Lu Feng when he grew serious. He couldn't blame the man for being cautious and had no reason not to trust him, so Diego overlooked it. "Do you like stories?" Diego asked eagerly, before he took a deep breath and told one anyway. With an oral skill that reflected much practice, he assumed a storyteller tone as he told one of Trixie's favorite tales. It was a story of Madam Trixie, the Pirate Queen, who sailed the seven seas fighting wicked men and chasing treasure. This particular tale was one where her and her fleet of a thousand ships fought against a corrupt leader of a small country to the south of the Western Continent. He spoke using his arms to bring the story to life while Trixie purred at his side, pleased to hear the story. "Anyway, if you can tell, Trixie loves stories about the Pirate Queen. That's how she got her name." He smiled brightly at Garret before looking back to the road. The smile left his face as he bent down, looking at the tracks left in the dirt. The lessons that his father had taught him kicked in as he studied each marking. He noticed that there was a great deal of horse traffic along this stretch and stood up. "We should get off the road now." Pointing to the woods along the side of the path, Diego took the lead and stepped through the treeline. Taking care of where he stepped on the leaf-covered floor, he traversed quietly, Trixie as well. The pair of hunters stalked through the woods until they could see the fort through the trees. The fort was located at the foot of the mountain, blocking the path further up the pass. With a couple clicks of his tongue, Diego told Trixie to scout out the perimeter. With a quiet grunt, the tiger melted into the woods, following them around the camp to sniff out and spot the guards. While they waited Diego whispered, "We'll see how many there are before we go in." Staring past the trees, Diego thought he made out two archers along the walls. When Trixie came back, Diego fed a stream of magoi into his Beast Tamer's Bracelet and asked her how many there were. A few green Rukh fluttered by, unseen by the Fanalis, as her grunts were translated into a form Diego could understand. He got a picture of two men atop the wall and four others that patrolled around the fort. "I'm going to make a distraction so you can get around and slip inside." With that Diego motioned for Trixie and Zanzibar to wait behind as he sprinted out of the woods. When he was within thirty meters, Diego loudly shouted, "HEY! GIVE ME MY PURPLE RUKKIES BACK!" Getting the attention of the camp, the Black Crow Archers brought an arrow to their bows and aimed it at the boy. Two of the Black Crow Swordsman approached, unsheathing their swords as they got closer. They stood ten meters away and leered at the boy, "Your what? Are you lost boy?" Diego shook his head with a pouty lip, "My purple Rukkies!" He stamped his foot, cracking the ground. "Give them back!" 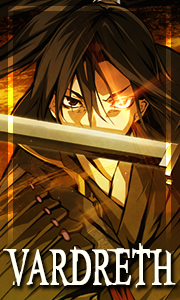 With that he burst forward and aimed a punch at the Swordsman on the right. His fist met the man's face and sent him back, but not before he stabbed Diego in the side. The Fanalis ignored the metal biting through his side and spun to face the other Swordsman. Unlike his friend, the second swordsman was ready and directed a horizontal slash towards Diego's head. Diego stepped back and way from the slash a little too slowly, receiving a scratch to his cheek. He hissed from the sting and jumped in the air to perform a spinning kick. His leg crashed against the man's skull and knocked him to the ground, his sword sent spinning away. With a piercing whistle, he signaled for Trixie to come to him. By this time the archers had alerted the camp of his presence and loosed their arrows. Diego landed from his kick and heard one of them whiz by his head as the other struck him in his shoulder. Realizing he was a sitting target, Diego began to run in a zig-zag motion to avoid any oncoming arrows. He winced as he unlodged the arrow from his shoulder and scolded himself for getting sloppy. Slipping Determination off his shoulder, Diego nocked five arrows and launched a Multi-hit at the Archers. Each arrow fanned out and with the distance between Diego and the the archers, only one struck home. Meanwhile, Trixie ran out of the woods and stumbled upon an unsuspecting Swordsman trying to creep around Diego. With a pounce, Trixie tackled the man to the ground and slashed his chest with her claws before continuing on towards her master. Seeing the archers send two Aimed Shots at Diego, Trixie snarled and leaped over the wall to land on the ramp nearby. The man cried out as she charged forward and slashed the man's belly open, spilling his guts to the ground. The man collapsed opening up a shot for the final Archer to launch a Flying Net at the tiger. Trixie got tangled in the net, lost her footing and fell onto the wooden floor. With a hiss, the white tiger used her fangs to tear through the net. The archer shot her with an arrow as she got out of the trap, hitting her in the back, inches from Zanzibar. The spider warbled as Trixie pounced onto the Archer, her fangs snatching his throat violently. Diego was able to dodge one of the Aimed Shots sent at him, but the other hit him in the uninjured shoulder. He dropped his bow from the pain and dropped to a knee, but thankfully Trixie had taken over. After removing the arrow, Diego made sure it hadn't hurt anything vital and looked around, wondering how Lu Feng was faring. Description: Diego fires five arrows at 15 meters per second, and can hit up to 5 different targets. The arrows cause minor bruises or cuts. This deals a maximum of D-Tier damage. As they continued walking forward, Garret realized that the last man did not seem to follow them. He wondered about it for a moment, but didn't pay too much mind. The fewer people who witnessed his abilities, for now, the better. Garret knew that as time passed, and as he was required to kill less and less, the number of opponents who knew of him would slowly increase. He would need to keep something hidden; a secret technique he only used under dire circumstances, that would end those who witnessed it. The walk continued, and Garret left those thoughts behind, instead focusing on their surroundings. It wasn't very long afterwards that one of the beasts that the young child had alongside him hoped onto Garret. The spymaster shuddered slightly at the feeling of an over-sized spider crawling on his back. Stopping in his tracks, he looked over to Diego. "Have the beast removed from my back." It wasn't simply the strange feeling of the beast that suddenly jumped upon him that caused Garret to say this, but a need for caution; should this young child give a command, the beast could attack immediately. Garret's hand gravitated to where he had hid his wand on him earlier; the boy did not yet know he was a magician, and Garret wanted to keep it that way, but he would do what he had to do in the event that he was suddenly attacked. Garret scowled, his mood souring, as they walked up the path through the mountainous forest. Diego, the young child, had apologized for the spider crawling over Garret's back. Yet the Blue Magician was unforgiving. He held back any biting words he would have said to an adult, as the beast tamer was fairly young, but the interaction only served to darken the mood that had immediately surrounded Garret. The young beast tamer asked Garret if he enjoyed stories, and it took everything in him to not roll his eyes. Before Garret could respond, the child began telling a story. Strangely enough, the story was of the Pirate Queen 'Madam Trixie', an ally that Azix had secured some time back. Slowly, as Diego told his story, Garret unconsciously began to let go of his overall guarded mentality. The child's cheerful exuberance and straightforward mannerisms had an infectious quality about them, managing to pierce the mental stronghold that Garret held in place. Taking root, the eagerness and genuine storytelling grew and bloomed to the point that Garret suddenly realized he had a smile on his face. As soon as he noticed, however, he removed it. The child had a dangerously disarming appearance. Diego mentioned the link between beast and Pirate Queen, and Garret marveled at its ability to understand the human language. It was no simple creature, that was for sure. Diego paused, and knelt down to take a look at something. "I thought it coincidence that your... Beast... Shared the same name as the Pirate Queen. My friend has told me of her fierceness, so I suppose the name is fitting." That was the closest Garret would come to any sign of compliment. Garret's gaze followed the young boy's search, and he recalled the time he spent hunting wild beasts with Marinus Nerva. The Troubleshooter had taught him a thing or two about tracking beasts, but Garret's skill of that particular observation was not on the same level as the boy before him. Explaining to Garret that they should get off of the road, the spymaster simply nodded and followed the child's lead. He took note of Diego using a magical tool, and watched as the green Rukh flowed between child and beast. Another level of alertness to hold with the child; he held and knew how to use magical tools. Diego offered to be the distraction for the camp. Garret almost protested, but decided against it; if the child clearly wanted to take that route, then that was the child's choice alone. It was obvious enough to Garret that Diego had at least enough capability to handle a few opponents. He nodded, and began making his way, stealthily, to the opposite direction that Diego took. Garret had gotten some distance between himself and the young beast tamer, and waited for the distraction to come. It wasn't a long wait, by any means, yet Garret could only pause to reflect on the words used for that distraction. Purple... Rukhies? What the hell is the kid talking about? Garret shook his head, focusing back on the scaffolding that the various patrolling guards were running across to meet this latest disturbance. When the group passed by, Garret focused his energy and began running towards the three meter wall. Jumping, Garret performed the River Styx Style: Water Falls in Reverse technique, clearing the wall just enough to touch down on the scaffolds. He looked towards the camp, and gauged the reaction of the bandits who now seemed in full-scale conflict with the Diego who had caused the distraction just moments before. Archers were firing off arrows, and men seemed to approach the child from the ground. At least, that was what Garret had assumed. He hadn't the proper angle to see the young beast tamer from where he currently was. The survey of the battlefield was a brief one, and Garret soon jumped over to the central building of the fort. Unlike the camp, the fortress was a wooden outpost made of logs and was much sturdier than the cloth that held together the homes of those the spymaster had raided previously. This central building had an entryway door, but also a terrace door to survey the scene. Garret quickly ran to the side of the door, kneeling while he put his ear against the wood to check and see if anyone was on the other side. There were muffled steps of a group of individuals approaching, and Garret bit his lip while thinking on how he wanted to handle them. Listening carefully, he determined that there were likely three of them. As such, he quickly formulated a plan to deal with them. It seemed as if they were coming up the stairs in order to get a look at what all of the commotion was about. Garret inched his way towards the door, preparing himself for the moment the first man exited. The sound of the door opening gave Garret all the time he needed to stand up, just as the first man came out of the door. It seemed to be a simple swordsman, outfitted with their standard equipment. The confirmation of his opponent's standing within the army meant little, as Garret's attack had already shot out and landed upon his opponent, having been prepared to fire off as soon as the man got out of the doorway. It was the River Styx Style: Water Corrosion, a front kick that struck the opponent in the groin and had him down for the count. The man fell to his knees before passing out in pain, and the two men who were following him outside drew their weapons and dashed to greet Garret with weapons in hand. These two were certainly stronger than the rank-and-file he had met earlier on his journey here. Yet they were still on a lower level than the Magician; a trained espionage agent against a couple of bandits? Even so, Garret would not underestimate them. Though they were bandits, they were Black Crow bandits, and these two were likely battle hardened opponents that demanded a modicum of respect. The Black Crow General began to attempt to circle around Garret, but he would not give the man the opportunity to flank him alongside his ally who was still directly in front of Garret. Dashing forward and closing the distance, Garret swung with his right hand, performing the first of two techniques with his River Styx Style: Raging Current. The Black Crow Knight had other plans in mind, however, as the shield came up to defend against the punch and slide it over, allowing the man to Shield The Blow. Using the opening, Garret continued to get in close and followed up with the second part of his technique: a knee to the gut. While this brief exchange took place, the Black Crow General closed the ground between himself and Garret. He brought his blade down with his General's Fury. Garret, still engaged with his current opponent, only saw the movement out of the corner of his eye. That was simply a second pressing matter that Garret had to handle, though. The Knight Blade was coming down upon him as well. The Blue Magician didn't want to take the blows, but more than that he did not want the fight lasting overly long. He shot his hand forward, hitting the Black Crow Knight with a River Styx Style: Tranquil Strike. The blow struck the man's throat, just as both his and his boss' blows struck against Garret's flared up Borg. Having crushed the windpipe of the Black Crow Knight, all that was left was the Black Crow General that had just dealt a heavy blow to Garret's Borg. Gritting his teeth, Garret did his best to end the fight then and there; his right hand glowed with the strength of magoi behind it. Garret attempted to perform River Styx Style: Ikken Hissatsu: Deep Sea Harpoon. Noting the strength of the attack, the man brought up his General's Shield to defend against the technique, but was unable to hold out against the pure force that the strike held behind it. It dug slightly into the man's chest, and gave him pause as the wound sent a jolt of pain throughout the man's body. That moment was all Garret had needed. 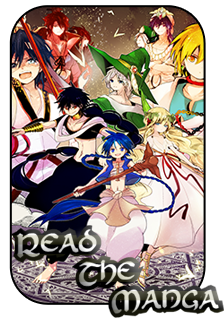 Grabbing Kuroi Shimo in his left hand, he spoke practiced words to the Rukh for a spell he had been thinking on; Ice Fist. The blow would slam into the Black Crow General, and send him flying off of the balcony. Damage Taken: B-Tier to Borg, C-Tier to Borg. The user sends out a kick at a speed of 15m/s. If it strikes the opponent, it would cause C-tier damage to the spot struck. Description: The user performs two C-Tier strikes with a combination of a punch and a knee to the opponent at a speed of 20m/s. If both strikes land, it delivers a total of B-Tier damage. Description: The user's attack moves at 15 m/s, through the use of their elbow. If the strike lands, it deals C-tier damage to the opponent. The user's arm becomes enforced by magoi, making it into a powerful weapon. The strength of this magoi supports every aspect of the arm, from the shoulder all the way to the tips of the fingers. The user of this technique shoots their hand through an opponent at 25 m/s, dealing A tier damage, and can potentially remove any 1 organ if the technique is not disrupted. Sustaining the technique continues the manipulation of the magoi, allowing another strike. The user gathers the water from the area and creates a .5 meter sized fist of ice within 1 meter from the user at 20m/s, which shoots forward and strikes at an opponent at 20m/s for B-Tier damage. Sustaining the spell allows this spell to be cast again. Once he removed the arrow, Diego ambled into the fort and met Trixie at the base of the ramp. He glanced his pets over and discovered the arrow lodged in Trixe's back, ignoring her blood-stained muzzle and paws. He gave her a kiss on the top of her head and gently removed the arrow. Satisfied, he turned to survey the encampment, noting Garret standing atop a balcony. From a distance, Garret didn't seem to have any grievous wounds, so the boy waved eagerly before wincing in pain. The arrows had hurt him a bit more than he had thought now that the adrenaline was wearing off. Managing a smile, he called out, "Is that all of them?" He checked through a few of the buildings to make sure there were no stragglers and also to riffle through drawers for valuables. Diego mostly found money and stolen jewelry which he shoved into his sack to split with Garret later. He also found a map that revealed a Black Crows encampment further up the pass, which he shared with the Kouen man. "Shall we attack this one as well?" A growl erupted from the Fanalis boy's stomach, "Maybe we should wait until the morning." Not only was Diego hungry, but he needed to rest and tend to his wounds. He found some bandages in a drawer and proceeded to remove his shirt. Using his teeth to tear off a section, Diego wrapped the cloth to dress his wounds. After he was done, he retrieved strips of jerky and passed them around the group to eat. "Yes. I believe that should be everyone." Garret made sure his voice was loud enough to be heard by Diego before making his way down from inside the building. He was careful to keep a watchful eye out for those still around, though his attentiveness was proven unnecessary. When he got to the ground floor, he met Diego who was searching around for things within the building; he noted the child pilfering the belongings of the dead without a care in the world. Many people had a moral line that kept them from such acts, yet this child had no such compunctions. He was amazed and simultaneously upset; this child had been forced to take the belongings of those he has fought against in order to make his living. A struggle, he hoped, that Azix's workforce programs would help alleviate. When Diego approached Garret with a map, he asked if they should go for the next one as well. Garret nodded. "That is the plan. I intend to remove their presence from the area; for my friends, and for others who would have otherwise encountered them on the road." They were too dangerous to leave as they were, and he did not want to allow their group to continue their current operations. It was then that Diego suggested they rest for the night; a thought Garret was going to decline, at first, until he realized the child had wounds. Though he did not know where Diego was from, Garret recognized that one day he, too, would become a citizen of Kou. Pulling out his Royal Dragon Fan, Garret cast Desceld, Gold Dragon's Blessing by pouring magoi into the magic item and fanning it towards Diego. "Do not be alarmed. This is for your own good." Originally the thread was open for Jian to post in as well. Now that both Diego and I have exited, I have removed Jian from the thread title. Description: The blessing is activated while fanning the Royal Dragon Fan and infusing it with magoi. This spell creates a golden healing mist shaped in the form of a Kou Dragon. This dragon is 1 meter long and .2 meters in diameter. This 'dragon' moves and flies about at the will of the caste at 20m/s within 30 meters of the caster. Upon coming into contact with a living being, the caster may choose to activate its effect. The mist enters and dwells within the body of a being it came into contact with after activation, creating an imprint of that living creature's body's peak condition. It advances the healing process of the body, healing up to B-Ter damage that was dealt to the body over the next three posts. This spell may be sustained to generate another healing 'dragon' mist on the user's next post and maintain any mist that has not been activated. Appearance: This fan is 25 cm in height, 5 cm in width and 2.5 cm in length when folded, and opens up to a 175 degree angle. Both sides contain the design of a gold dragon flying in the sky. Though made of wood and charmeuse silk cloth(16 momme), the craftsmanship is superb and on par with the deadliness of a weapon and can be used as a blunt stabbing tool or as a blunt club to dish out damage. Enhanced through the opal magical gem that is at the base of the fan and functions as a hinge, this item is fairly sturdy. 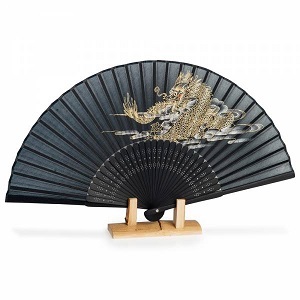 This fan doubles as a seal of Kou high nobility, with this particular dragon being registered as the Takegawa household's seal.